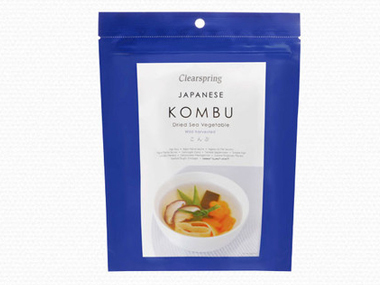 Buy Clearspring Japanese kombu 50g in the UK from our online shop or directly from our independent Scottish store. Soak and cook for 20-30 minutes to make 'dashi'. According to a recent study, regular bean eaters are 22 percent less likely to be overweight and have smaller waistlines than those who pass on legumes. Beans release energy slowly into the body, making them a great weight loss food. 'They are also high in protein and fibre, which satiates the appetite and helps keep you full for longer periods of time.' This recipe contains 2 stamp size pieces of Clearspring Kombu. Where can you buy real Japanese Kombu safely online? If you are wondering where you can buy Clearspring Japanese kombu 50g safely online in the UK, then shop with us.